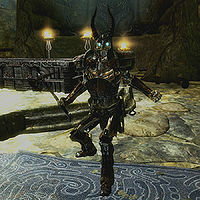 This article is about the draugr version of Olaf encountered in Dead Men's Respite. For the version of Olaf One-Eye encountered in Sovngarde, see Olaf One-Eye. King Olaf One-Eye is the end boss of the Nordic ruin Dead Men's Respite. If you manage to knock Olaf to a spot directly behind one of the draugr thrones, he may go idle, stop attacking you, and simply stand behind the chair with his weapon drawn. This is most easily done with three words of the Unrelenting Force shout from the top platform of his chamber. ? Knocking Olaf from his stuck position behind the chair will cause him to start attacking you again. This page was last modified on 10 October 2013, at 02:31.